Weaving on Beka Loom Tutorial | knit Mama knit! I will continue my basic, newbie tutorial on how to weave a balanced weave on a Beka loom here in the coming months. Check back! Here are direct links to the first 3 steps I created last August. Step I’m a Dork and messed up. Step four to follow! Here is a great site to see the entire process from sheep to woven product. I suspect I’ll get back to weaving this fall. I haven’t forgotten that many of you want me to continue this lesson. 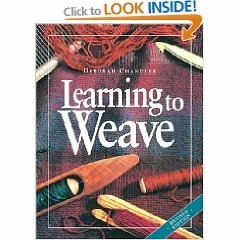 My best advice is to buy a book on weaving. I found Deborah Chandler’s book Learning to Weave to be excellent for us beginners! Have you seen Weavolution (www.weavolution.com). Lots of incentive to start weaving again.